We’d love your help. Let us know what’s wrong with this preview of A Picture of Murder by T E Kinsey. Late October 1909, and the season of ghouls and things that go bump in the night has descended on the village of Littleton Cotterell. Lady Hardcastle and her trusted lady’s maid, Florence, find themselves hosting a colourful cast of actors whose spooky moving picture, The Witch’s Downfall, is being shown to mark Halloween. But things take a macabre turn when the first night’s screening ends with a mysterious murder, and the second night with another…One by one the actors turn up dead in ways that eerily echo their film. With the police left scratching their heads, Lady Hardcastle calls upon her amateur sleuthing skills to launch an investigation, with Flo’s able assistance. Surrounded by suspects both human and supernatural, Lady Hardcastle must use a little trickery of her own to unmask the murderer. To ask other readers questions about A Picture of Murder, please sign up. I've read all the Lady Hardcastle novels. Does anyone have a suggestion for a similar series that I can get into? My job is stressful and I like the tone and ease of these books. And if I can get it for $2.99 or less on Kindle that would be a nice bonus. Georgia Lengyel Try Celina Grace, Emily Brightwell, M.C. Beaton, Alyssa Maxwell, Hanna Dennison, and Anna Lee Huber. All have women as the main characters. I have just found this book on here. Is it necessary to read these books in order or, if I start with this book, #4, will I be lost? An intriguing cozy, full of wonderful, whimsical characters. Lady Hardcastle has been asked a favour of from a friend. The friend's kitchen has burned down, just when she was playing hostess to a visiting film troupe. Lady Hardcastle instantly obliges, and with the help of her capable ladies maid Florence Armstrong, she makes the visitors welcome. Until one by one they are murdered. In the same way that their onscreen characters are killed. Our amateur sleuths then spring into action, but are pe An intriguing cozy, full of wonderful, whimsical characters. Lady Hardcastle has been asked a favour of from a friend. The friend's kitchen has burned down, just when she was playing hostess to a visiting film troupe. Lady Hardcastle instantly obliges, and with the help of her capable ladies maid Florence Armstrong, she makes the visitors welcome. Until one by one they are murdered. In the same way that their onscreen characters are killed. Our amateur sleuths then spring into action, but are perplexed by the murders. Nothing here is as it seems, everyone can kind of account for their whereabouts during the murders, or can they? This is a delightful book, the first of this authors that I have read. It is the fourth book in the series and while the reader would benefit from reading the other books first, to get a bit more background of the characters, it's not really necessary. I recommend this book to all lovers of lighthearted crime novels. Book 4 in this excellent series. Even Lady Hardcastle and Florence, her maid, comment in this one about how many people seem to die within their general vicinity. Luckily just for once the murders may not be quite what they seem. Our two leading ladies are as entertaining as ever and we find out quite a lot about their past lives when they were spying for King and country. Lady Hardcastle calls Flo "tiny servant" and Flo is equally rude back and it is all very funny. I also enjoy the fact that th Book 4 in this excellent series. Even Lady Hardcastle and Florence, her maid, comment in this one about how many people seem to die within their general vicinity. Luckily just for once the murders may not be quite what they seem. Our two leading ladies are as entertaining as ever and we find out quite a lot about their past lives when they were spying for King and country. Lady Hardcastle calls Flo "tiny servant" and Flo is equally rude back and it is all very funny. I also enjoy the fact that the police acknowledge that the pair have detecting skills and bring them in to the enquiries rather than resenting their presence. It is a refreshing change from many other cosies. Littleton Cotterell was about to host a screening of one of the first moving pictures and as it was nearing Halloween, the picture was appropriately named The Witch’s Downfall. Lady Hardcastle found herself with the four actors in her home, as her good friend and original host’s kitchen caught alight, and of course they would need to be fed. It was 1909 and the chill was definitely making itself felt across the countryside, but that didn’t stop Lady Hardcastle and her trusted lady’s maid, Floren Littleton Cotterell was about to host a screening of one of the first moving pictures and as it was nearing Halloween, the picture was appropriately named The Witch’s Downfall. Lady Hardcastle found herself with the four actors in her home, as her good friend and original host’s kitchen caught alight, and of course they would need to be fed. It was 1909 and the chill was definitely making itself felt across the countryside, but that didn’t stop Lady Hardcastle and her trusted lady’s maid, Florence, from venturing out. The success of the first night was heartwarming – apart from the protesters with their banners – but when the frosty morning gave light to a body under the large old rowan tree, everyone was shocked to find one of the actors – dead, in a spooky copy of the entertainment of the night before. 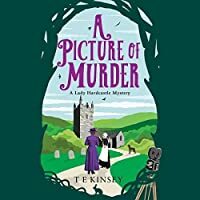 A Picture of Murder is the 4th in the Lady Hardcastle Mysteries by TE Kinsey, and I thoroughly enjoyed it – as I have all the others! A historical cosy mystery with a humerous touch – I laughed out loud many times. The interaction between Lady Hardcastle and Flo is brilliantly done! Dry and hugely entertaining. The twists are also well done, and I certainly didn’t pick the culprit! Highly recommended – can’t wait for #5! In Late October 1909 the inhabitants of Littleton Cottrell are gearing up for Halloween and Bonfire Night. While Lady Hardcastle poo-poos the superstitions of the villagers, her ladies' maid, Florence Armstrong, has a more open mind. When a kitchen fire at The Grange leaves a filmmaker and his actors stranded, Lady Hardcastle steps up to host. She is eager to see their kinematograph (moving picture), The Witch’s Downfall, and show off her own amateur efforts. Not everyone is thrilled about this In Late October 1909 the inhabitants of Littleton Cottrell are gearing up for Halloween and Bonfire Night. While Lady Hardcastle poo-poos the superstitions of the villagers, her ladies' maid, Florence Armstrong, has a more open mind. When a kitchen fire at The Grange leaves a filmmaker and his actors stranded, Lady Hardcastle steps up to host. She is eager to see their kinematograph (moving picture), The Witch’s Downfall, and show off her own amateur efforts. Not everyone is thrilled about this new fad and believe moving pictures are evil. When real life starts to imitate art, Lady Hardcastle and Flo are disturbed and some of the villagers think the moving picture has put a curse on the village. With Inspector Sunderland busy elsewhere and the local police not up to the task, it's up to Lady Hardcastle and Miss Armstrong to solve the mystery before it's too late. Wow! This was a very complicated mystery that not even Lady Hardcastle could solve until the very end. I was starting to suspect something was not quite right before she did and I was frustrated because some of the clues were glaringly obvious and Lady Hardcastle chose to ignore them. This story isn't for everyone. I was disturbed by how dark it was but enjoyed trying to figure out what was going on. In this novel Lady Hardcastle and Flo finally share their life stories. I felt that all that information at once was too much but at the time time, I was eager to learn what really happened. I was a bit confused because Lady Hardcastle keeps saying her husband was killed by Chinese bandits. Is that the official story? I am very eager to see how the subplot about Lady Hardcastle's past plays out. I also could have used a brief explanation of what the Boxer Rebellion was. I couldn't remember the details. I was pleased to see this novel contains an author's note explaining his minor tweaks to the history of early film and the moonrise. I would have liked more information about the film industry in Great Britain in the early 1900s. The details included in the story are excellent though and if readers are that interested I suppose they can look it up. My favorite scene is a lighthearted one. It involves Hamlet, a Great Dane who doesn't know his own size or strength. Hamlet is such a silly puppy! I loved him so much but wouldn't want him jumping and drooling on me, as much as I am a crazy dog lady. There are 6 new characters here, 5 from the film industry and 1 journalist. There's also the protestors. Nolan Cheetham is a charismatic showman and filmmaker whose star is on the wane. He has come to the village to show his new film, The Witch's Downfall. He is friendly and charming but he is a promoter and could be performing dastardly deeds to promote his film. I was impressed by his professional filmmaking and special effects artistry. Zelda Drayton is another star on the wane. She's an excellent actress and seems nice enough. Miss Euphemia Sellwood is the new leading lady. She's a bit too aware of her beauty and star power. Basil is the old theater actor turned moving picture actor. He is VERY self-aware and a jovial chap. I think he's a bit phony. Aaron Orum, screenwriter and frenemy of Nolan Cheetham is a whiny, self-pitying, wannabe aesthete. If his side of the story is true, he does have reason to be angry but it didn't sound as if he had pursued legal action. Could you sue someone in Edwardian England? Orum's latest girlfriend is a sensational journalist who is a very unpleasant woman. Any one of them would do anything to further their own careers. Mr. Hughes is the leader of the Westboro Baptist Church-type group that comes to the village to protest the film. He's too self-righteous and lacks an understanding of village culture. He reminded me of the nay-sayers who decried Harry Potter when the books were first published. I detest those who try to tell other people what to do and how to live their lives and detest those who would censor art to suit their own ends. Needless to say, Hughes is not a likable character. Yet, he is slightly sympathetic in a way. The world is changing too fast for him. 4.5 Stars for another fun cozy mystery. I love listening the audiobooks of this series. I tried reading it myself after I started the audiobook and I ended up returning to the audiobook. The narrator Elizabeth Knowelden does a wonderful job. She really makes it entertaining. This is the latest cozy mystery featuring Lady Emily Hardcastle and her lady's maid & partner in investigation, Florence Armstrong. The time is October 1909 in the village of Littleton Cotterell, England. On Halloween, th 4.5 Stars for another fun cozy mystery. I love listening the audiobooks of this series. I tried reading it myself after I started the audiobook and I ended up returning to the audiobook. The narrator Elizabeth Knowelden does a wonderful job. She really makes it entertaining. This is the latest cozy mystery featuring Lady Emily Hardcastle and her lady's maid & partner in investigation, Florence Armstrong. The time is October 1909 in the village of Littleton Cotterell, England. On Halloween, the village hosts a new form of entertainment - a showing of a motion picture, The Witch’s Downfall. The director and actors are staying at Lady Hardcastle's estate. But one by one the actors meet their deaths in a similar manner as in their film. Its up to Lady Hardcastle and Florence to find and stop the murderer. It maybe one of the better mysteries of this series. But to tell you the truth, I just enjoy visiting the characters, Lady Hardcastle and Florence, not to mention the villagers and Inspector Sunderland. We even meet up again with the musicians, Barty and Skins from book #1, A Quiet Life In The Country. Which may be the best part of the book when Lady Hardcastle and Florence tell Barty and Skins their history together - how they met and ended up spying for the British government. In the previous books, only snippets of their exciting and unusual pasts are told. Lady Hardcastle is no ordinary "Lady". We also learn that Lady Hardcastle is 42 years old. Younger than I assumed as Flo often refers to her ladyship as "The old girl" and the like. It is late in 1909 and the moving pictures are coming to Littleton Cotterell! It’s Halloween and the choice of films to be shown is timely. Mr. Nolan Cheatham is the director/producer and with him he has brought the three stars of his latest production, The Witches’ Downfall. After a fire in Lady Farley-Stroud’s kitchen, the four movie people are staying with Lady Emily Hardcastle and Florence Armstrong’s home. In spite of the Hughes’ protestors outside the church hall, there is a crowd for the viewing and it is a great success, as is Lady Hardcastle’s own Town Mouse and Country Mouse production. On the morning following the entertainment, Sergeant Dobson shows up at the door of Emily and Florence’s home. He has bad news. Mr. Basil Newhouse, one of the actors staying at their home, was found murdered in the churchyard. The murder was staged to look like the murder of his character in the short film viewed the night before. The list of potential suspects is rather long. Inspector Suderland has come from Bristol to investigate the case. Emily and Flo know him from cases past and he appreciates their help. Then actress Euphemia Selwood is found dead in the kitchen at Emily and Flo’s home. In her hand is a partially eaten apple, just like the character in the moving picture. Could it have been poisoned like in the film? More deaths occur and the puzzling aspects of the case grow. In a thoroughly surprising ending, the case is resolved by Emily and Flo. I was excited to read more about Emily and Flo’s past adventures. This time it was how Emily was recruited and her and Roddy (her husband), adventuring in Shanghai and environs – with Flo’s assistance, of course. I find the characters of Emily and Flo entertaining with their banter and gently kidding one another. The book is well written with a few misspellings and minor typos. It is linearly plotted. The characters are interesting and engaging. I look forward to the next Lady Hardcastle and Flo adventure. I want to thank NetGalley and Amazon Publishing UK for forwarding to me a copy of this delightful novel for me to read, enjoy and review. The story, as always, was curious and captivating (can’t put it down!) AND I find I learn a good bit about the time period in the process. Historical cozy mystery fiction at its best! Lady Hardcastle and Florence Armstrong are back and better than ever. This is the fourth book in the Lady Hardcastle Mystery series. The novel opens up on All Hallows’ Eve. Ghosts and ghouls are abound in Littleton, Cotterell. A film producer, Mr. Cheetham, and his film crew arrive at town, at the perfect time, to show their moving picture, The Witch’s Downfall. Things go awry though when one of the film’s actors is found dead and killed in the same manner as his character. Lady Hardcastle and Armstrong put their skills to use to try and solve the murders. But, are they looking for a supernatural being or a living person? This novel is fun from start to finish. It is my favorite book in the Lady Hardcastle series. We meet old and new characters and each character is distinctive and unique. Ultimately, however, it is the repertoire between the characters that makes this novel so great. The interactions between Lady Hardcastle and Armstrong are particularly memorable. We also get a small glance at some of Lady Hardcastle and Armstrong’s secret past. This past seems to have prepared them for the sleuthing they do in the present. Their skills are sharp enough to captivate the police, who not only inform them on the progress on the case, but also encourage their help. Not only is the mystery solved at the end of the book, but we get a hint of a relationship in the making. Something fun to look forward to in the next book. I really enjoyed this book, and it was a entertaining October read. This fourth book in the Lady Hardcastle series didn't have quite as much of the humor I adore, but was still a good addition to the series. I would like to thank Netgalley and Thomas & Mercer for an advance copy of A Picture of Murder, the fourth novel set in 1909 to feature amateur sleuth Lady Hardcastle and her maid, Florence Armstrong. Littleton Cotterill is gearing up for its first moving picture festival and through an unfortunate accident Lady Hardcastle is hosting the "film folk", director Nolan Cheetham and three of his cast. The film, The Witch's Downfall is mostly well received wih several notable exceptions so when a c I would like to thank Netgalley and Thomas & Mercer for an advance copy of A Picture of Murder, the fourth novel set in 1909 to feature amateur sleuth Lady Hardcastle and her maid, Florence Armstrong. Littleton Cotterill is gearing up for its first moving picture festival and through an unfortunate accident Lady Hardcastle is hosting the "film folk", director Nolan Cheetham and three of his cast. The film, The Witch's Downfall is mostly well received wih several notable exceptions so when a cast member is found dead in a manner echoing the film Lady Hardcastle and Flo are drafted in to help the hard pressed Inspector Sunderland. I thoroughly enjoyed A Picture of Murder which is a light, frothy tale with a genuine mystery attached. It is narrated by Flo Armstrong so the reader sees everything through her eyes. She is a most unusual ladies maid so her tone is sardonic and amusing. I found myself caught up in both her narrative and the plot which held my interest from start to finish. I loved the period detail and the information about the fledgling movie industry is fascinating from the attitudes towards it to the mechanics of filming. I also admired Mr Kinsey's ingenuity in his plotting. It maybe requires a stretch of credulity but it fits the tone of the novel and made my jaw drop at its cleverness. As I said Flo Armstrong is a very unusual ladies maid being more of a friend and confederate to Lady Hardcastle than a servant. I was interested to see Mr Kinsey expanding on some of their adventurous past which he has hinted at in previous novels. It adds to the fun of the read. It’s the fall of 1909, and the kinematograph (known as the movies to us) has come to the Gloucestershire village of Littleton Cotterell. Colonel Nolan Cheetham and three of his actors are showing their film The Witch’s Downfall, a melodramatic work sure to appeal to unsophisticated and superstitious villagers. Of course, the showing is a great success, but then one of the actors is killed in exactly the same way as his character was in the movie. Needless to say, retired spy Emily, Lady Hardcast It’s the fall of 1909, and the kinematograph (known as the movies to us) has come to the Gloucestershire village of Littleton Cotterell. Colonel Nolan Cheetham and three of his actors are showing their film The Witch’s Downfall, a melodramatic work sure to appeal to unsophisticated and superstitious villagers. Of course, the showing is a great success, but then one of the actors is killed in exactly the same way as his character was in the movie. Needless to say, retired spy Emily, Lady Hardcastle, and her sassy maid Florence Armstrong do their part to help the Bristol CID crack the case. But not before there are several more deaths. In the autumn of 1909, Ghosts and witches and things that go bump in the night have the whole village in a dither right as the film festival gets underway featuring a spooky moving picture about a vengeful witch. Lady Hardcastle and her ladies maid, Flo Armstrong, have their hands full as murders staged just like scenes from the movie leave them with another mystery to solve. I enjoy the Lady Hardcastle mysteries for the fun turn of the century historical setting, for the lively, quirky character In the autumn of 1909, Ghosts and witches and things that go bump in the night have the whole village in a dither right as the film festival gets underway featuring a spooky moving picture about a vengeful witch. Lady Hardcastle and her ladies maid, Flo Armstrong, have their hands full as murders staged just like scenes from the movie leave them with another mystery to solve. I enjoy the Lady Hardcastle mysteries for the fun turn of the century historical setting, for the lively, quirky characters of the eccentric lady and her maid who are a retired British spy team, and for the lively way the mysteries are presented in a blend of historical and cozy mystery. Each book has Lady Hardcastle with a new hobby enthusiasm. In this case, she is practicing using her camera to make stop-action movies and hosting an early era moving picture film company of actors in her home for the village festival. I chuckled often at the quirky local villagers and the banter between Lady Hardcastle and Flo. The plot took its time with daily life in Lady Hardcastle's home, the village, and the goings on at the cinematic festival with the murders and their investigation coming along slowly. Inspector Sutherland is back as are Skins and his bandmate from earlier books A past issue from their espionage days comes up, but is left open to tease the reader a bit of what is to come of that. There are several times when I caught things repeating themselves each time someone new came along and the characters can make the same exclamation like 'right you are' or the housekeeper calling everyone 'lover'. Just little niggles, but distracting. The mystery kept me guessing until near the end and still, I ddn't have the entire thing figured out right so got a surprise at the big reveal. The narrator, Elizabeth Knowelden is a repeat favorite and a splendid match for this series. She voices Lady H and Flo exceptionally well, but does a great job with class accents, both genders, and the pace and tone of the story. She captures a bit of sparkle to her voice that makes me think if I saw her characters it would be the equivalent of a twinkle in the eye. All in all, it was another wonderful outing with a fun, eccentric pair of amateur detectives. The mystery had a great twist and I loved the seasonal theme that gave a light spooky feel at times without being scary. Those who enjoy cozy mysteries and early twentieth century England should give these a go. It is fall 1909, and in A Picture of Murder by T.E. Kinsey, Lady Emily Hardcastle and her lady’s maid/ partner in investigation, Florence Armstrong, have been having fun since their last adventure. They have spent their time practicing making moving pictures, which they call kinematographs. So when their neighbor has a fire in her kitchen, Lady Hardcastle is thrilled to get to host a quartet of “film folk” at her home since the Grange is out of commission. The team of three actors and their prod It is fall 1909, and in A Picture of Murder by T.E. Kinsey, Lady Emily Hardcastle and her lady’s maid/ partner in investigation, Florence Armstrong, have been having fun since their last adventure. They have spent their time practicing making moving pictures, which they call kinematographs. So when their neighbor has a fire in her kitchen, Lady Hardcastle is thrilled to get to host a quartet of “film folk” at her home since the Grange is out of commission. The team of three actors and their producer/ director is in the small town of Littleton Cotterell in Gloucestershire to show their films, in particular their crowning film, The Witch’s Downfall. But this film has developed opposition. Aaron Orem, once a close friend and colleague of producer Nolan Cheatham and now personal enemy, has been following Nolan to let the world know his opinion that Nolan stole his idea for a script in The Witch’s Downfall. Then there are the Hugheses, who have also been following the film folk to protest the evil of witchcraft that they think is in the film, despite never having seen it. the whole backstory again? cute mystery. The author loses a star for telling the whole Armstrong/Hardcastle meeting story again. I understand about needing to bring new readers up to speed, but it seemed like padding. Perhaps it is set-up for the next adventure, but still. Cute mystery otherwise. Enjoyed the chemistry, both as part of the mystery and the characters. Still a bit convoluted. Being the definition of a cozy mystery series, these are light and breezy. A little bit of danger and a lot of brandy, coupled with an excellent audiobook narrator, and it's easy to polish off in an afternoon or two. These books are nothing but delightful. They're hilariously funny, socially conscious, with amazing female characters and a perfect setting. I need about a million more books in the Lady Hardcastle series. I love a lot of things about this series but I got more sheer delight out of the first couple. However, I'll keep reading as I love the characters. Also I was glad to finally get Lady Hardcastle and Flo's backstory. How delightful that we get full disclosure of Lady H's & Flo's back story about how they came together and became spies for HM's government and how her dear Roddy was murdered by a Russian assassin. Wundervoll! Gefühlt wird die Reihe immer besser. 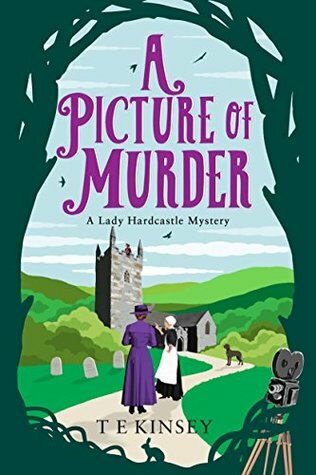 I approached A Picture of Murder as a lover of cosy historical fiction and I found pretty much what I’d expect in this Edwardian whodunnit — something very frothy and folksy. It’s the fourth in the Lady Hardcastle mystery series and the first that I’ve read, but that didn’t matter, because it works well as a standalone. It’s a light-hearted and not-terribly credible romp through the Herefordshire countryside, where a visiting cast of a moving picture actors find themselves flung on Lady Hardcast I approached A Picture of Murder as a lover of cosy historical fiction and I found pretty much what I’d expect in this Edwardian whodunnit — something very frothy and folksy. It’s the fourth in the Lady Hardcastle mystery series and the first that I’ve read, but that didn’t matter, because it works well as a standalone. It’s a light-hearted and not-terribly credible romp through the Herefordshire countryside, where a visiting cast of a moving picture actors find themselves flung on Lady Hardcastle’s hospitality, and are bumped off one by one. It ends with a big twist. And that’s more or less what it has too offer. In that sense, it delivers. The problem is that, for all that’s good about it, for me it falls just short of being a good book. The story is narrated by Lady Hardcastle’s/maid companion/fixer, and we learn early on that she and her employer have a complicated history in His Majesty’s service. There’s a diverse cast of characters, from the villagers to the visiting actors to the group of Bible-bashers protesting against the new development of moving pictures — but I didn’t feel that any off them were particularly well-developed. The villagers were simple-minded, the aristocracy very jolly, the policemen bumbling, and the relationship between Armstrong and her employer felt far too flippant for the times, even allowing for the fact that the pair are deliberately set up as eccentric. I did enjoy the plot, although the twist at the end stretched my credibility (and I was interested to see that the author’s note at the end conceded that the hook on which the plot was hung probably wouldn’t hold up). The conversation felt brittle in a sub-Wodehousian way, and I was reminded of Gilbert and Sullivan long before the first of several references to the Pirates of Penzance. A Picture of Murder isn’t bad, by any means. It’s just that it falls short in the key thing I look for in any murder mystery, which is believability and the ability to engage with well-rounded characters. Of course, that’s a personal thing and other people may well love it. I would certainly read more in the series, although there are authors whose approach to the genre whose books I would pick up first. The fourth in the adventures of Lady Hardcastle and Flo takes us back to the quiet village of Littleton Cotterell in 1909 Gloucestershire. I say quiet, but Littleton Cotterell has been anything but quiet since the formerly globetrotting Lady Hardcastle and her "tiny servant," Flo Armstrong, settled there. Mysteries and murders have been plentiful, all needing the skills of the ladies to solve. It's late October and with the advent of Halloween and Guy Fawkes Night, their friend and neighbor, Lady The fourth in the adventures of Lady Hardcastle and Flo takes us back to the quiet village of Littleton Cotterell in 1909 Gloucestershire. I say quiet, but Littleton Cotterell has been anything but quiet since the formerly globetrotting Lady Hardcastle and her "tiny servant," Flo Armstrong, settled there. Mysteries and murders have been plentiful, all needing the skills of the ladies to solve. It's late October and with the advent of Halloween and Guy Fawkes Night, their friend and neighbor, Lady Farley-Stroud, wants to organize something special for the village. She has invited a producer of the new moving picture shows, Nolan Cheetham, and his actors to premiere his film in the village. The film is a ten-minute masterpiece entitled The Downfall of the Witch. Lady Hardcastle and Flo get involved when a fire in Lady Farley-Stroud's kitchen makes her unable to put the troupe up as planned, and Lady Hardcastle steps in to offer them accommodation. The film's showing is a huge success, despite noisy, bible-thumping protesters who think that moving pictures are the devil's workshop. The success of the show is dampened when one of the actors is murdered shortly after its premiere, in the same manner as in the film. Other deaths follow, and it will take all the ladies' skill to solve this convoluted puzzle. A Picture of Murder is as delightful as its predecessors with quirky characters, a charming setting and a tricky puzzle to solve. The villagers, local police and household staff we have come to know make appearances, along with a pair of jazz musicians from an earlier book. We get the whole story behind Lady Hardcastle and Flo's journey through China and India, along with a foreshadowing of events to come. Flo even gets to demonstrate the martial arts skills she learned on those journeys while taking down the culprits. I especially love the friendship forged between Lady Hardcastle and Flo. They are nominally employer and servant but are more like sisters. These novels are perfect escape reads, and I recommend reading them in order to maximize the enjoyment. Thanks to Thomas & Mercer and NetGalley.com for an advance digital copy. The opinions are my own. Thank you so much to Amazon UK for the eARC of the latest Lady Hardcastle mystery! I fell in love with Lady H and Armstrong when I listened to the first book last summer - I flew through the first three, and I was delighted to be back with the inhabitants of Chipping Bevington. Such a fun series for lovers of historical, cozy mysteries with spunky heroines. I absolutely love this series on audio (I pre-ordered before I read the ARC), so I recently just finished listening to it in that format as w Thank you so much to Amazon UK for the eARC of the latest Lady Hardcastle mystery! I fell in love with Lady H and Armstrong when I listened to the first book last summer - I flew through the first three, and I was delighted to be back with the inhabitants of Chipping Bevington. Such a fun series for lovers of historical, cozy mysteries with spunky heroines. Seemed a little long and drawn out, however the story itself was good. The characters are fun and well developed. received a copy of this book from the publisher, Thomas & Mercer, and the author via netgalley in exchange for an honest review. Actual rating of 3.5 stars. Lady Hardcastle and her hand maid Flo Armstrong are living a quiet life in Littleton Cotterell, a small village near Gloucestershire in England. A moving picture festival has been invited to the village and the townsfolk are incredibly excited to see what they have to offer. When the kitchen burns down at the house the film folk were planning to stay, Lady Hardcastle is approached and asked if she would mind putting up the village guests, to which she agrees. However, when the film folk start dying in the same way that their characters are killed in the headlining moving picture being showed, Hardcastle and Armstrong find themselves thrown into yet another mystery. Who is murdering the village visitors? Is it the jealous former friend of Mr. Cheetham? The protesters who believe that the moving picture is evil? It's a mystery shrouded in shadows, and Lady Hardcastle and her hand maid, Armstrong, have their work cut out for them. This is actually the first story I've read in the Lady Hardcastle Mysteries series. I didn't realise when I requested this that it was number four, however, this doesn't impact the reading of the story at all. Sure I've missed out on the evolution of Hardcastle and Armstrong's relationship, but it doesn't actually leave me feeling confused about anything. There are some references to past mysteries that they've been involved in, but these are pretty detailed so I didn't feel as though I missed out on anything at all. I found the characters charming, Hardcastle is a quirky woman who is rather endearing in her nature, as well as Armstrong, I love their characters, and the relationship between them. Hardcastle treats Armstrong more as a friend than a hand maid and I absolutely love this. The same can be said about the cook and cleaner as well, it's such a relaxed atmosphere for these characters which wasn't so much heard of in the early 1900s. The language used in the book took a little bit of getting used to, but that's to be expected, old style cockney English, as I would put it, can be a bit hard to understand at times, but it really gives the reader the feel of the time period. This was a very calm, slow moving novel with a lot of flowery writing. I feel that if it was done any other way, however, that it just wouldn't have been the same. At times I found that the book felt way longer than it actually was, but I think this was because of the pacing and the writing style. While the pacing was on the slower side, it was consistent, so it worked perfectly for this story. The mystery was done incredibly well, I had a couple of ideas of who was behind it all, and I actually had it right, but I didn't know that until the final reveal which is perfect for me. It's never much fun if you happen to work out the mystery halfway through the story and the character's are still fumbling around in the dark utterly clueless. The way that the deaths were done was brilliantly thought out and had me puzzled which is a nice change from other mysteries that I've read. It really had me thinking and trying to work out how this was done as things just weren't adding up. I felt all the frustrating that the character's did, it's great. This is the fourth in the series, but it is fine as a stand alone – relationships and previous events are explained fully. In fact, I have read all of the series and in this book the reader learns the history of how Lady Emily Hardcastle and her maid, Florence Armstrong, first met and the adventures they had in the past. Both of them are well equipped to solve mysteries, defend themselves and most of all be wonderfully witty. A small group of actors who perform in a film become guests at Lady Hard This is the fourth in the series, but it is fine as a stand alone – relationships and previous events are explained fully. A small group of actors who perform in a film become guests at Lady Hardcastle's home. There is the director, writer, producer as well as 2 actresses and 1 actor. They are charming, personable and filled with interesting stories about their pasts. They will be presenting a film to the village and the director and actors will speak to the audience. It has caused a wonderful buzz in the village. Everyone is excited to see the film and meet the stars. Along with the film people, there are protesters who picket because of the evil associated with movies and movie people. The film people are all condemned to hell. There is also an old friend who has become an enemy of the film's director and the entire cast. When the body of one of the cast members appears under a tree at dawn, with a stab wound to the heart, there are many possible suspects. Lady Hardcastle and Flo are a wonderful team of sleuths. They understand one another well and each of them admire the strengths and skills of the other. Their sarcastic humor runs rampant throughout the story. Because of their past experiences, the local police as well as the officers of the upper echelon welcome the help that both ladies bring to the case. This is quite a case. As dead bodies continue to appear, every logical theory seems to be in error. Motive after motive is determined to be wrong. But, since people continue to turn up dead, there must be some reason for it. I have enjoyed every book in this series. The plotting is outstanding. The reader is given all the facts and solving the mystery is a step by step journey which we get to share. Character development is absolutely perfect. Not only are Lady Hardwick and Flo well developed but they are also complete human beings. They are good people who are not perfect. The victims and their histories are filled with what may be some of the most interesting of backgrounds. Show biz is a large part of the action. The villagers are typical of small town people all over the world. They are supportive of one another and also willing to pry into every bit of privacy of their neighbors. If several dead bodies can be considered fun, this is a fun story. I love the series, I love the writing and the humorous plots keep bringing me back for more. This is my favorite book of the series. It's the unexpected meets the unexpected. This would be a complicated story to describe. The .Ian characters are Lady Hardcastle and her maid. They are wonderful characters for a PBS/ Series. I related to films like Larkrise to Candleford, Downton Abby , and other shows to give me a visual image of the characters in the story. I could imagine the role of the cook in Downton Abby to be similar to the cook that works for Lady HardCastle.. The series are best read in sequence, but that's my preference. It seems to give the reader time to learn about characters that first appeared in one story to learn more about them in the next story. where there is more information about their background. Each book can stand alone and the characters show great respect for each other even as they nest with each other. The author is very through and descriptive of the era in which they live. Live in the turn of the century was a time of change and growth both in Europe and America. at the turn of the century. This story begins with the Lady's continuing interest in early film., and how people in the area felt about movies. There was a lot of superstition and religious conflict that the villagers believed. This story combines the mysterious murders that seem to be a real life enactment of the Film/movie that was presented to the villagers who attended. All of the events that appear to lead to the demise of the Actors ,one at a time actually makes the film more popular with the townspeople, and give credibility to the superstitions those who believe in the superstitions, as well as those who are against the Film by a group of individuals who believe the film is a tool of the Devil and are protested by a group who oppose the film based on their personal religious beliefs. With each showing of the film afterwards there is an event that portrays a real life event exactly like that in the movie..